Within seven years, artificial intelligence will be in full throttle and workers will have to compete with robots, objects that never complain and make no mistakes, said a member of the business faculty. Randy Saleh, NE business assistant professor, gave students advice on how to help propel their careers and keep them employed as technology evolves. Students need to develop their emotional intelligence, he said. Everyone has an emotional bank account where daily deposits and withdrawals are made during social interactions, Saleh said. If an employee lets their bank account become overdrawn, chances are that employee will not be around long. “Deposits within the bank account that build trust in the workplace are showing attention to detail, finishing projects on time, working with the team and using initiative,” he said. One major deposit is to sincerely apologize when one makes a withdrawal from someone’s trust account, such as when an employee misses a deadline or is rude at work, Saleh said. “Company executives are having trouble finding college graduates with soft skills,” he said. Emotional intelligence is the ability to be aware of, control and express one’s emotions, Saleh said. 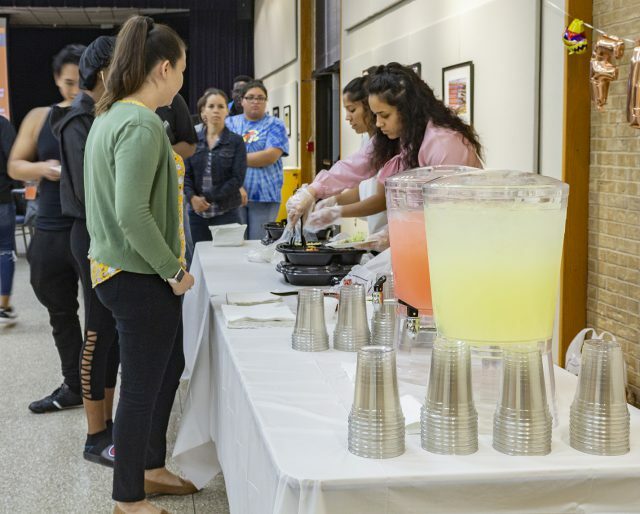 NE students, faculty and staff in attendance go through the line to get tacos as the event was part of the Let’s Taco Bout It series. The five components of emotional intelligence in the workplace are self-awareness, self-regulation, motivation, empathy and social skill. Self-awareness is the ability to recognize and understand one’s own moods, emotions, and drives as well as their effect on others. This can result in a higher self-confidence, he said. 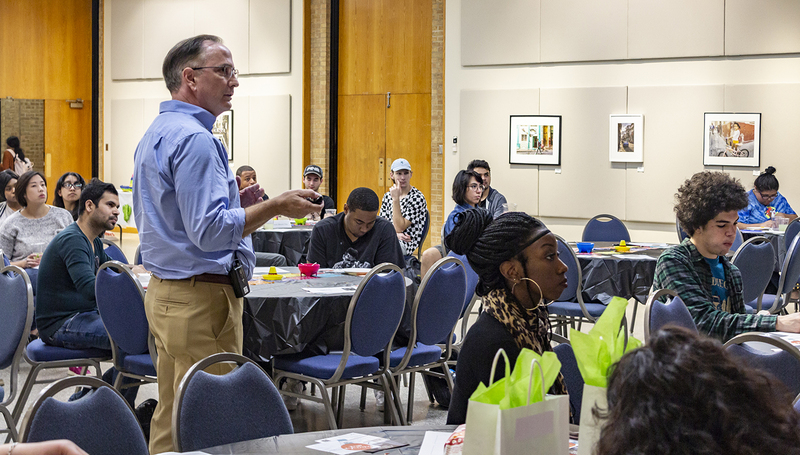 Saleh told students self-regulation is learning to think before acting or reacting and can result in an increase of trustworthiness and integrity in the eyes of coworkers and employers. Being able to tell when someone’s emotions are open and ready to talk about a project or the career itself might result in a promotion or a raise. NE student Betzy Heredia said there was a lot of useful information that will be beneficial when going into a job interview. “Having these events is important to create well-rounded students who are ready for the workforce,” she said. It’s important students are aware that there is more to a career than just the technical elements, said Michelle Peters, an on-call student development associate on the NE campus. Emotional intelligence is the key to a good career, Saleh said. He advised students to become proactive and begin with the end in mind. “Paint a mental picture of what a future career and life will look like,” he said.